Elementary Greek is an ancient a Greek text that’s both simple and substantial. 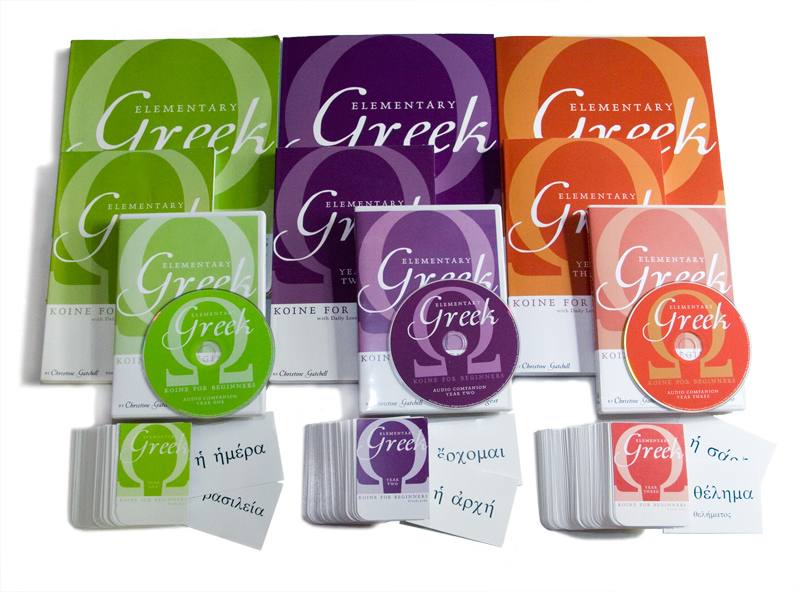 Designed to be used as a full course for teaching children as young as 2nd or 3rd grade, Elementary Greek may also serve as a self-teaching program for teens and adults. No previous knowledge is necessary and each concept is covered thoroughly and reviewed regularly throughout the course. Each year of the course includes a textbook, workbook, audio companion, and flashcards. Each text includes thirty weeks of daily lessons, which can be used for a year-long course, or covered at the student’s own pace—faster or slower. The texts include memory work, grammar lessons, review work, and practice exercises. The workbooks incude daily exercises and activities to coach translation skills and to reinforce concepts from the text. The audio companions provide pronunciation, listening, and fluency guides for the material in the texts, and the flashcards facilitate vocabulary review. The textbooks were written by Christine Gatchell; I acted as product lead for the publication of the series at Open Texture, a small publisher I co-owned from 2003 to 2013. I also read the audio companions for all three years (in at least one case, a four year-old also enjoyed listening to me read Greek at bedtime.). In 2013, the Elementary Greek line was sold to Memoria Press, where they are now available in new editions.